We are pleased to publish the first Brief of a series drawing on the project ‘Diverging Capitalisms? Britain, the City of London and Europe’, led by FEPS, Policy Network and SPERI. 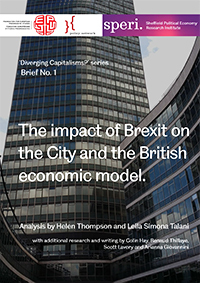 In this Brief Helen Thompson and Leila Simona Talani consider the impact of Brexit on the City, focusing on two key aspects of the debate: the tensions between the City and democratic politics, and the challenges for the future of the City posed by the vote on 23 June for Britain to leave the European Union (EU). The analysis presents findings from the first workshop in the series entitled, ‘Diverging Capitalisms, Part 1: The City after the Crisis’ which was held in London in April 2016. The project considers the changing nature of the British economy, its place within the European economic space and the consequences of Brexit for Britain and the EU more broadly. Download Brief No. 1: The impact of Brexit on the City and the British economic model.